It's official. It's spring—tra la! The tulips are popping! The cherry trees are bursting! The peas are poking their little first leaves out of the soil! I'm using too many exclamation marks! No planting tender annuals until after the last frost date for your zone. for when you can plant tender veggies and flowers in your zone. to plant. You look at your forlorn, bare garden, and the tease of spring makes you crave soil under your nails. Soon, soon...just be patient. OK, I'm also impatient. That's why I'm sharing the perfect project to give you a spring gardening fix. And you can plant it RIGHT NOW! Hmmm. That sounds a bit like a poorly organized southern cotillion. Strawberries herald spring. They're one of the first fruits to show off their adorable little blooms, quickly followed by deliciousness. Who can resist that sweet, sun-warmed berry, picked fresh from the field? And what's a more perfect snack for the kids than strawberries dangling within reach—while they ride scooters in the driveway or climb trees? What's more refreshing than savoring a strawberry snack as you toil away in the garden? It's a perfect reward for your labor. 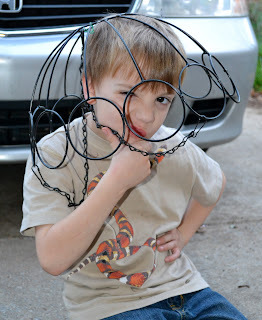 Plus, this is a really fun project to do with your kids. 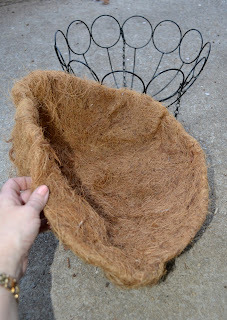 12” round hanging container with removable coconut fiber liner. 10-12 small strawberry plants, ever-bearing variety. 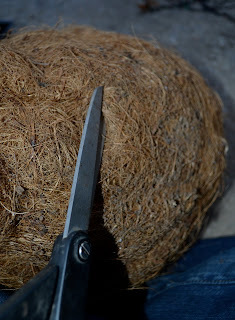 First, remove the liner from the hanging basket. Using scissors, make a total of six small, evenly spaced holes around the lower and mid portion of the liner circumference. (I staggered the height of the holes a bit.) Do not make the holes too large or your plants will fall through and soil will spill. Next, take a strawberry plant and insert the plant into the hole. Carefully pull the flowers and stems through the hole to avoid breakage. You can use standard strawberry varieties, or you can try something a little special--Fraise des Bois. 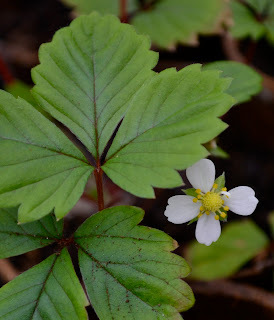 These are tiny, trés sweet, adorable alpine strawberries that produce fruit all summer until the first hard frost. I grow both Red Wonder and Yellow Wonder varieties--and I think the yellow berries are even sweeter than the red. Fill in the lower holes first. Add soil to the liner to help support the roots. The plants will be hanging somewhat upside down. Now, fill in the next tier of holes with strawberry plants. These plants' roots will be placed horizontally in the basket. Add additional soil to cover the roots, and firm the soil to prevent plants from slipping out of place. It's time to move to the top--you know, the place where we normally plant flowers in hanging baskets. Place one plant in the top center of the basket and evenly space four additional strawberry plant along the edge of the basket. Add additional soil to cover the roots and firm it into place. These plants will fill in the top of the container and spill over the sides as they grow. ...who turned it into the Death Star and declared war on the rebel strawberries. Carefully, lift the liner with the soil and plants into the basket. 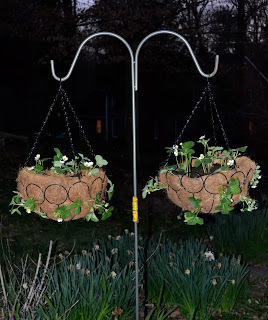 Gently insert the plants through the metal design of the basket to ensure they hang freely. Untangle the chain from the hanging basket. (This was, in my experience, the hardest part of the entire project, because I somehow managed to twist the chain. Lovely.) Make certain the chain's placement won't break any of the plants. Hang the basket in a spot that receives six to eight hours of sun. This is, normally, a pretty sunny location...just not at 9 p.m. when I finished both baskets. (Friday nights are very exciting around here.) Water well. Now, don't you feel better? A little garden therapy always helps chase away the winter blues. Soon, your strawberries will begin growing and spreading and filling in the gaps so that your container will be one, big blooming ball...and your pretty little flowers will turn into delicious, tasty treats.